Mullet Haircut Photos & Tips: What Is A Mullet Haircut And When Did It Start? So, what is a mullet haircut? Well, it's been around since the 60s and was very popular during the 80s with many hockey players. It has actually started seeing a comeback recently, thanks to the number of magazines employing models who enjoy the retro look. This hairstyle is cut short in the front and left long in the back. There is a range of hair lengths left in the back. Hair can reach to the shoulders or all the way down to the waist. Mullet haircuts are more common on men and can be a fun change from the traditional buzz cut or flat top for the summer. 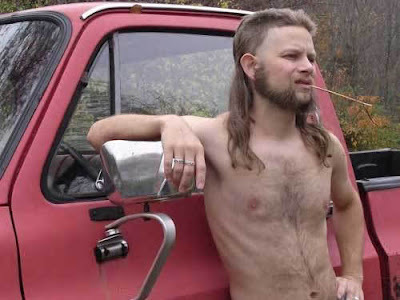 Not everyone can pull off the same style of mullet, due to their face shape and hair type. For instance, individuals with a long face might prefer a mullet that is longer in the back as well. The mullet can be left to do its own thing or altered for a bit of flair. Some men find that adding a little curl to the length in the back is best done with a mild perm. This can add a bit of body to even the thinnest hair. Celebrities have even been seen sporting mullets pulled into ponytails or dyed in an array of colors. A few singers in the 70s and 80s had some fascinating mullets that caught on with the general public. Some men liked this hairstyle enough to keep wearing it, even today. Punk rockers have been known to combine a Mohawk with their mullet haircut. No special care is usually needed with a mullet haircut. These can be washed, dried, and styled the same as any other type of cut. Achieving the perfect mullet cut can be tricky, especially if the person giving the haircut hasn't a clue as to what a mullet is supposed to look like. Taking a photograph along of the desired mullet will eliminate the question: What is a mullet haircut?